When grain traders say “It’s all about theS&D“, they’re talking about known and projected supply and demand of grain. It’s the interaction between the forces of supply and demand for grains of different types and qualities that causes daily movements in grain prices. This blog piece examines the variability of wheat prices in Western Australia (WA) in recent years and touches on the main drivers of this variability. Figure 1 shows the way in which prices for five wheat classes grown in WA have changed, in real terms, over the period, 2009 to 2019. WA wheat production is shown as background grey bars. Figure 1: Prices of common grades of wheat and total wheat production in Western Australia, 2009 -2019 (Source: Profarmer/ACF, ABARES, GIWA) Note: Each price data point is a 28 day moving average. Low production volumes, such as in 2010 and 2012, are associated with higher prices. However, in general, higher prices are driven more by global factors than local factors, such as was the case in 2012 when the Russian wheat export ban led to sharply higher prices. That said, the price spreads between some classes are indeed affected by local production levels (Figure 2). Most noticeable are changes in the price spread for ANW in some years. Because WA is the sole supplier of ANW wheat to Japan and Korea, any low production year in WA is likely to trigger upward pressure on the ANW price. Worth noting is that the high prices in 2018/2019 occurred simultaneously with high production. However, the spreads in WA classes remained relatively normal, indicating an external factor was driving the price complex in WA. This external factor was the low production of wheat and other grains in eastern Australia, due to drought, that influenced grain prices and spreads in WA. Figure 2: Wheat price spread to ASW1 of common grades from 2009 to 2019, and Western Australian wheat production (2019$/t FIS Kwinana. Source: Profarmer/ACF, ABARES, GIWA) Note: Each price data point is a 28 day moving average. When a farmer sends the harvester into her wheat crops, she harvests a portfolio of wheat classes and grades, in spite of the farmer often planting a particular variety in the hope of achieving a certain grade. In assessing what varieties to plant, gross margin analyses need to account for likely downgrades. where p1, p2 and p3 are the proportions of the crop that achieve AH, APW and ASW status respectively. Table 1 provides the expected spread of prices, relative to ASW1 over the period 2009 to 2019. The prices could be used in the above calculation. The median values are the expected spread to ASW1, based on prices of grain FIS Kwinana, adjusted to 2019 dollars. The distributions of the spreads in Table 1 are mostly approximately normally distributed, but not in all cases (see Figures 3 & 4). APW1 - is reasonably symmetrical, with 50% of observations being roughly $5 each side of the median. The expected value is $13.0 more than ASW1. ANW1 - displays a long tail to the right and an overall very wide variation in its price spread. A marked shortage of ANW causes its price to increase significantly. In an average year the ANW price is usually less than the AH price. However, in poor production years, the high price for ANW creates a natural hedge, or cover for the slightly lower yields of ANW varieties. Figure 3: Distribution of the price spread of ANW1 and APW1, with ASW1 ($/t FIS Kwinana 2009-2019. Source: Profarmer/ACF). Note: dark purple bars indicate overlap of APW1 and ANW1 observations. AGP1 - is reasonably symmetrical. The expected spread is $10.1 less than ASW1 with 50% of observations being within $6 each side of the expected spread. APW2 – has a median spread of $10.1, with a symmetrical distribution. AH1 – is also symmetrical, but it has a fairly wide range in its price spread. The 25th-percentile price is still $28.3/t higher than the ASW1 price. Only in 25% of observations is the spread lower than $20.0/t. The 75th-percentile is $37.3/t above the ASW1 price. This means that in 25% of cases the spread will be higher than $37.3/t. 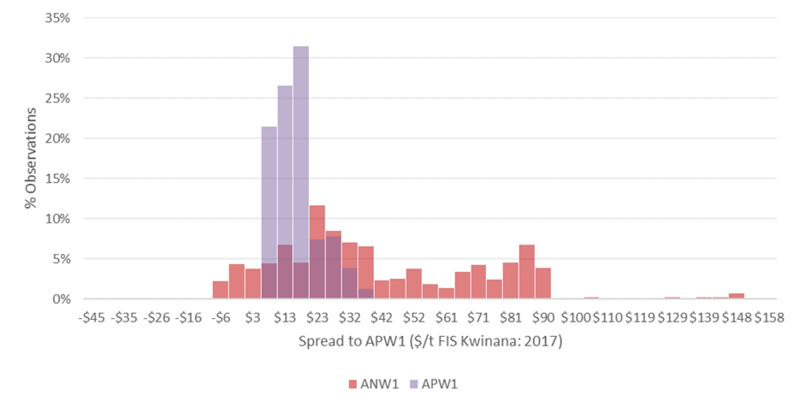 Figure 4: Distribution of the price spread of AGP1, APW2 and AH1 with ASW1 (2019$/t FIS Kwinana 2009-2019. Source: Profarmer/ACF) Note: darker bars indicate overlap of APW2 and AH1 or GP1 observations. Why does the price variability of the various grades matter? By planting a portfolio of varieties (e.g. AH, APWN and ANW varieties) farmers can spread their price risk. Prices in some grades vary more than in others; and the ANW1 grade acts as a natural hedge against widespread low production. Over the last decade, in real terms, the main grades of wheat produced in Western Australia, APW, ASW and AH, have been subject to mostly symmetrical price movements. The price spreads of AH, APW and AGP relative to ASW are also fairly symmetrically distributed. The exception is ANW that has a skewed price distribution. As a minor grade, ANW has infrequent very high prices. Planting ANW varieties can be a natural hedge against widespread poor production.